> Baby's Room>Children Room "Stars"
Children Room "Stars" There are 19 products. 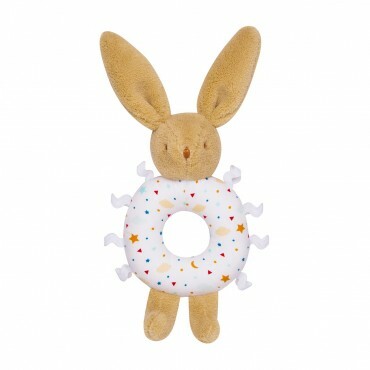 One "Must Have" : Bunny rattle Ring - Stars 12CmIdeal for the awakening of your child.Washing 30°, no tumble dry. A beautiful Baby Sleeping Bag Stars for your baby (0 to 6 months). This Baby Sleeping Bag is reversible. Washing 30°, no tumble dry. Delivered in Gift box. A beautiful Baby Sleeping Bag Stars for your baby (0 to 12 months). This Baby Sleeping Bag is reversible. Washing 30°, no tumble dry. Delivered in Gift box. Square Playmat “Stars” with musical box. 90cm x 90cm. Washing 30°, no tumble dry. Delivered in Gift box.